With the price of West Coast Pinots floating upward behind those of Cabernets, we assembled a set of recently released wines for our group's evaluation. 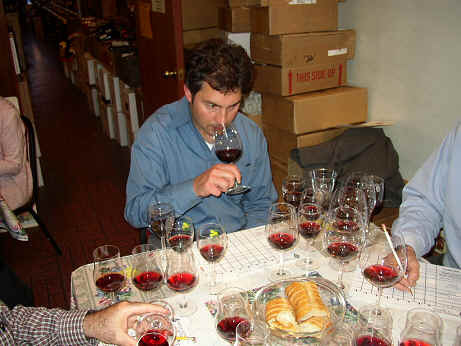 Most of the wines were from the 2001 vintage, though a couple of just-released 200s were included. One wine was statistically well ahead of the group and two wines were well behind the pack. 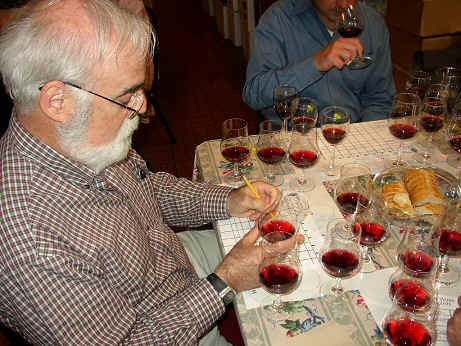 Only three of the 8 wines received a last place vote. One wine was bargain priced at $20, while the rest were in the "whatever the market will bear" category. 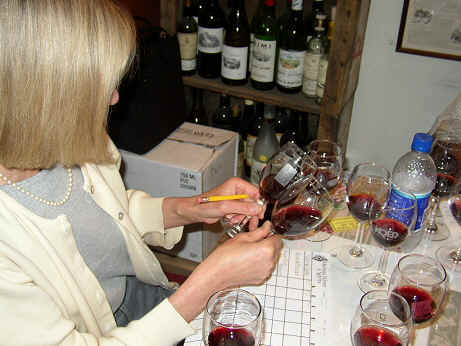 Some vintners have over-estimated their importance in the grand scheme of things. 8TH PLACE: ADRIAN FOG 2001 ANDERSON VALLEY PINOT NOIR "SAVOY"
mushrooms, metallic notes and an earthy, medicinal finish." Gerald described this as "Medicinal, with band-aid fragrances and tons of seriously over-ripe fruit. This has more to do with Late Harvest Zinfandel than anything resembling Burgundian Pinot Noir. I don't know what they're stomping at the Savoy, but it isn't Pinot Noir! An amateurish effort with an appallingly high price tag. We received a phone call from the irate owner and winemaker of the Adrian Fog wine, telling us we may have had a bad "bottle" of his wine. 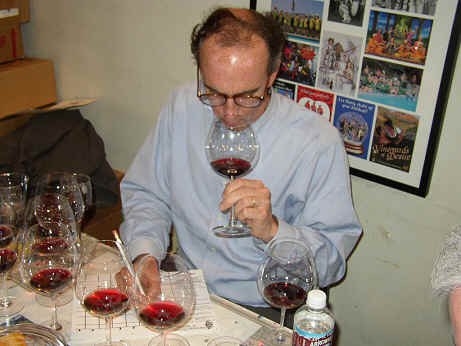 He argues our publishing the tasting note above is irresponsible, taking exception with the adjectives "band-aid" and "amateurish effort." Citing his wine as a high quality, premium product, winemaker Stewart Dorman told us "My wine is served in some of the country's finest restaurants." 7TH PLACE: BEAUX FRRES 2001 WILLAMETTE VALLEY PINOT NOIR "BEAUX FRRES VINEYARD"
Bob found it soft and spicy on the nose, reminding of quince jelly. 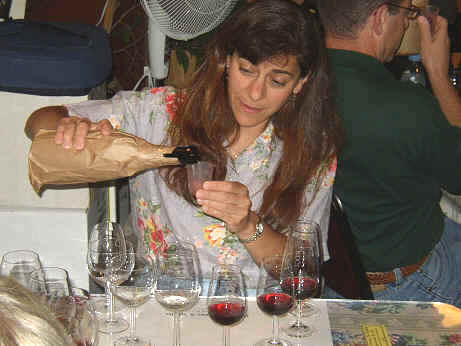 Descriptors offered by the tasters included "rye bread, low acid, tobacco, earthy, musty, rose petals, charred plums, hazelnut, Central Coast Pinot Noir, weak and under-ripe fruit." Gerald found some brown spice notes and Oriental spices with hints of grapefruit and rose petal. The wine is more aggressive on the palate than one might expect from such a charming fragrance. He gave it a one-half star rating on his 3 star scale (no stars being standard quality). 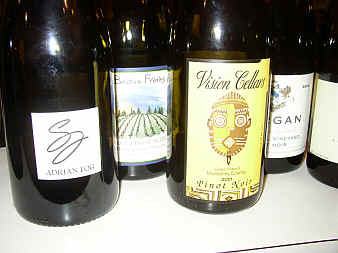 6TH PLACE: VISION CELLARS 2001 MONTEREY COUNTY PINOT NOIR "GARYS"
found "persistent Mercaptan; a soft, warm and flabby wine." Bob found bright Pinot fruit verging on shrill with a "peach-leaf"
Gerald described this as the most Beaujolais-like wine of the tasting, this offering showing cherry and strawberry fruit with a hint of cola. As charming as it is on the nose, the wine is hot on the entry and this alcoholic bite reduces the charm factor considerably. Perhaps a one-half star rating is in order. 5TH PLACE: MORGAN 2000 SANTA LUCIA HIGHLANDS PINOT NOIR "DOUBLE L"
the palate. Bob sided with the yea's. Gerald found some woodsy and earthy notes with forest floor fragrances and wet leaves on the aromas. The Brettanomyces "leather" aromas add a point of interest, but some may be repulsed by this character. There are some beet root and pencil shaving notes here, too. Nice wine. Half star rating. At half the price of its peers, this wine showed very well indeed. and weak" and "herbal and pallid." 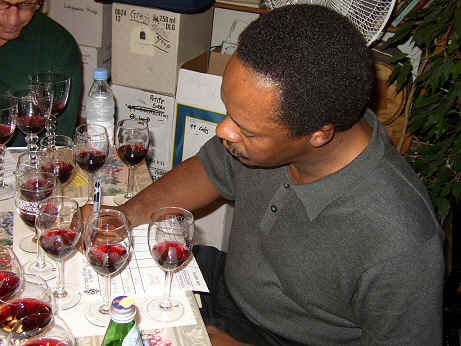 Gerald liked the sweet cherry fragrances and beet root aromas. He found a bit of root beer, too, and nice, vanillin oak. The flavors are rather cherryish with good length and tremendous balance. Very charming and drinking now. One-and-a-half stars. 3RD PLACE: SIDURI 2001 SANTA LUCIA HIGHLANDS PINOT NOIR "PISONI"
earthy finish." A detractor found it "bitter and hot." bright point would be preferred. Gerald encountered ripe berry notes and some spices reminiscent of cloves and nutmeg with some toasty oak and vanillin. It's very ripe and mildly tannic. The spice notes come through nicely on the palate, making for one rather complex wine. One-and-a-half stars. 2ND PLACE: ROAR 2001 SANTA LUCIA HIGHLANDS PINOT NOIR "ROSELLA'S"
tobacco". Another found it too heavy-handed in the oak department"
while another thought that there was H2S (hydrogen sulfide). Gerald found this to have a very sweet perfume with cherry and berry fruit dominating the nose, along with a toasty oak component. The cherry fruit flavors on the palate combine with nice vanillin and a hint of mocha to make for a very handsome and balanced wine. Two stars. Here is a major Pinot Noir statement: bright with lots of cherries, spice, and "terroir"(an intriguing earthy tone). The wine is bright in the mouth too; long, balanced, excellent structure, spice, some grip. It has the best chance among its peers to develop nicely over the next two to five years. The tasters liked it for "its rich blackberry fruit" its "silky texture" its "intensity on the nose and the palate" and "hint of star-anise." 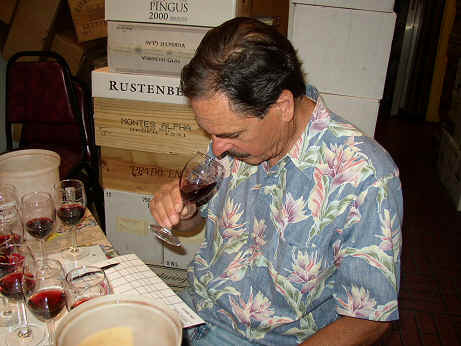 Gerald found a mildly woodsy note to this berryish Pinot with a pencil shaving-sort of fragrance. There's a touch of heat here detracting a bit, but it's still a charming wine. One star.